James Barber has suffered with asthma his entire life - having been in and out of hospital as a child. He describes it as "gasping for air that you just can't get". People aged between 10 and 24 years old are "more likely to die" from asthma, with UK mortality rates ranking in the bottom out of 19 high-income countries, according to a report by the Nuffield Trust. James says he wakes up in sweats because he's struggling to breathe. "It's best described as a tightness in your chest that you can't overcome," he tells Radio 1 Newsbeat. The 25-year-old says he has trouble scheduling check-ups due to a lack of availability, and believes the UK could do more to help people with asthma. "Asthma is a life-long health condition," he says. "Knowing that the UK is one of the worst countries to be dealing with it puts the fear in you." 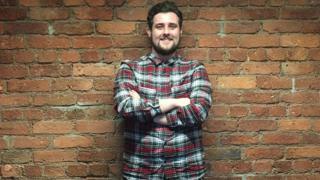 James, who lives in Manchester, struggled to manage his asthma when he went to university. "With studies and essays taking precedent, your physical health can often be left by the wayside." James says it can take two months to get an appointment with his GP, which means problems can get worse, and he has to get an emergency inhaler from a high street shop. "You don't want to keep putting yourself in that situation." The exact cause of asthma isn't known, according to the NHS. People who have asthma have swollen airways that narrow and become clogged with mucus in response to certain triggers. Triggers can include illnesses like cold or flu, allergies, inhaling smoke, sudden changes in weather, mould or damp, and exercise, among other things. Someone suffers from a potentially life-threatening asthma attack every 10 seconds, the NHS says, and asthma attacks kill three people in the UK each day. James thinks doctors need to give asthma sufferers a "better understanding" about what can trigger it. "Particularly when it comes up to sensitive periods like winter. If you know the cold affects me, check in and make sure everything is OK."
Meg Dupont, 24, found out that she had asthma after suffering an attack as a baby. She rarely gets attacks now, but experiences an asthmatic feeling, triggered by hay fever, animal allergies and exercise. "It gets progressively worse for me, because it's not a sudden attack. "It's hard to describe and the panic is probably the worst, the adrenaline of not being able to breathe." Meg says that she often forgets to take an inhaler out with her, but even when she remembers there's another problem. "I haven't seen anyone in public using an inhaler. It sounds ridiculous but it puts me off using mine in public. I've been on the tube and thought, 'I don't want to draw attention to myself, I'm going to get off and use it when I'm walking'." Juliette Rowsell was diagnosed with asthma at 15 when she had a life-threatening attack. The 21-year-old Cardiff University student is allergic to dust and mould and finds student housing uncomfortable to live in - after moving into her house in second year and finding she couldn't breathe she needed an emergency doctor's appointment. "I always have problems when I move into a new home and have an adjustment period when my body just gets used to the house. "I keep waking up in the night, needing my inhaler, and have an air humidifier which I have to sleep with it on quite a lot of the time." Juliette says the latest statistics "hammer it home" that asthma can be really serious. Dr Andy Whittamore, a GP based in Portsmouth, tells Newsbeat that additional statistics from Asthma UK suggest two thirds of 18 to 29-year-olds are not getting the care required to protect themselves from life-treating attacks. He thinks the NHS needs to communicate better with people suffering from asthma, and that technology can help with that. "The NHS is talking a lot at the moment about improving technology and digital care for people and I think asthma can be at the centre of that. "Even just simple things like collecting the right data so we know who's had an asthma attack and when, we know who needs follow-ups from these events but also communicating to people to actually remind them of appointments and things like that."